XL series throttle pedal assembly pad measures 2" wide x 5" tall. Lokar offers their billet aluminum pedals in two different sizes to fit almost any driver and interior. They are available in the Standard Series pedals and the extra large "XL" Series for those seeking more comfort and safety. Gas pedal assemblies features a spring-loaded pad like OEM design. 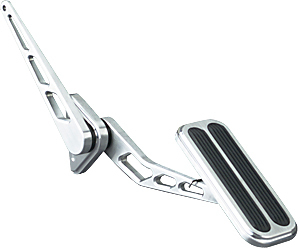 The removable lower throttle assembly arm is splined for versatility in mounting the throttle pad to the right or left side of the pedal mounting bracket. The shaft and upper arm are a one piece design, requiring no pins. Matching brake pads are designed with a 1/2" x 20 thread and includes a 1/2" x 20 stud in kit. Brake pad can be mounted centered or off center. Dimmer switch pads are available in one size only. "XL" Series Dimensions 2" x 5" 3-3/4" x 2-3/4"
Standard Series Dimensions 1-1/2" x 4" 3" x 2"